Sensors: Two primary arrays (1 upper, 1 lower), Range of 18 Light Years. Each primary array has a back up Secondary array. Range of 12 Light Years. Each array can be set long, medium, or short range. Hub: The Hub serves as the Operations center of the station and is located at the intersection Y and Z rings. It features multiple levels including a centralized briefing table, a dedicated workstation for the Security chief, and multiple other stations. The Captain's office is directly attached. Memorial Deck: This deck is positioned just above the Li Nalis Park, with visibility of most of the station. This deck has plaques dedicated to all those who died during the Destruction of Deep Space 9 as well as a plinth describing the original station and its origins. A piece of bulkhead from the first station is also on display here. Li Nalis Park: The 'Park is a large, natural area featuring cultivated woodland, swimming pools, a theatre, and other recreational areas. The park also serves as a component of the station's life support system. Plaza: The Plaza is the social and shopping center for the station and serves as the Promenade for the new station. Amongst other establishments located here are Quark's Bar, the theatre, and the Replimat. 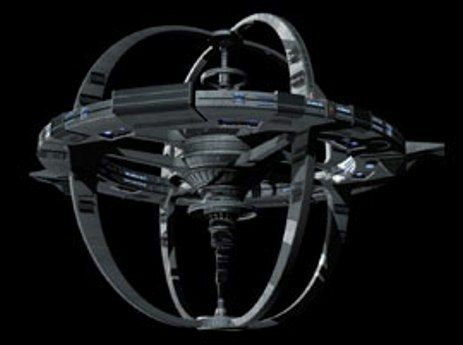 Hospital: Also known as Sector General, the Hospital is the medical center of Deep Space 9 and is directly beneath the Plaza. Stockade complex: The stockade complex is the detention facility on Deep Space 9 and is overseen by Constable Odo.